TV reality star and Survivor’s dumbest winner ever, Richard Hatch, was released from federal prison Thursday after four years of serving time for tax evasion. He was sent to a halfway house in Pennsylvania where he will remain until October 7th. Richard Hatch was the “fat naked guy” on season one of Survivor and the first contestant to truly play the game – he outwitted, outplayed, and outlasted with cunning intelligence. It wasn’t until after he won the million dollars that he got stupid. 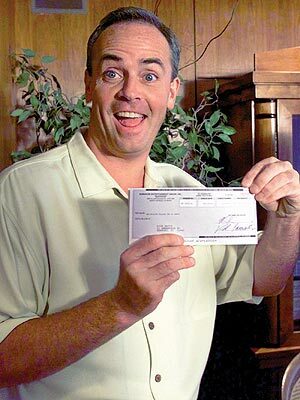 In January 2006 Richard Hatch, 48, was convicted after being found guilty of not paying taxes on his $1 million prize from Survivor. He claims he thought the show’s producers would take care of those pesky things. Obviously the people at CBS tell a different story. Prior to his Survivor appearance, Hatch was a corporate trainer from Newport, Rhode Island. He spent five years in the United States Army – two of them at the United States Military Academy (would have been Class of 1986) from which he dropped out of after two years, is a licensed real estate agent, and has also worked as a car salesman and a bartender. Throughout the duration of Survivor, Hatch claimed his profession as a corporate trainer aided him in his ability to deal with other people.